In collaboration, UCI’s Elliot Botvinick and UCLA’s Gerry Weinmaster published complimentary studies in the journal Developmental Cell, in which they each used optical tweezers to detect and measure mechanical force produced by cells when bound to Notch, a cellular pathway that serves as a communication network to ensure the correct cell types form at a precise time and location in the body. Using this technology, the UCI-UCLA team found that communication through the Notch network involves a “tug-of-war” between neighboring cells, in which Notch molecules are unraveled by force to reveal hidden elements important for cell-cell communication. 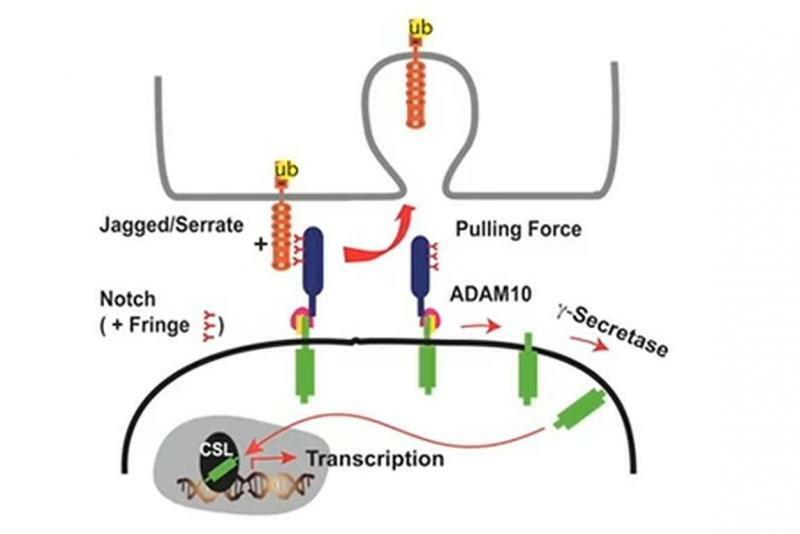 Together with biochemical and cell biological analyses, their findings provide compelling evidence that pulling on Notch opens a network to deliver information that instructs specific cellular responses. Their study sheds new light on the role of cell’s neighbors in the development and regulation of tissues and ultimately provides valuable insight towards the development of new therapeutics. Bhupinder Shergill with UCI and Laurence Meloty-Kapella, Abdiwahab A. Musse and Jane Kuon with UCLA contributed to the studies. The University of California Cancer Research Coordinating Committee, the Jonsson Cancer Center Foundation and the National Institute of General Medical Sciences (grant number R01 GM085032), the National Science Foundation (DMR 0805164) and the National Center for Research Resources and the National Institute of Biomedical Imaging and Bioengineering (P41RR001192, P41EB015890 respectively) of the National Institutes of Health supported this work. A video further describing their work can be viewed here. The full study in Developmental Cell can be viewed here.